This time of year, all us Aussies love spending time outside in our little slice of paradise. The days are longer, the weather is warmer—now is the perfect time to get outside and enjoy all that Mother Nature has to offer. But, does your garden need a bit of a boost? Just like the inside of our homes, sometimes our backyards need some TLC too. It might be that you’re tired of looking at the same old backyard. Maybe your wattle and lemon tree fail to excite? Or your Lilydale topping needs replenishing? Or maybe even your succulents aren’t quite as interesting as you first thought? Never fear, that’s where our team of landscape design experts can help. We’ve put together our list of top 11 garden ideas, all designed to help inject a little more life into your garden this summer. From large-scale remodelling, right through to small, simple suggestions, all our ideas will help you transform your outdoor space into the place to be this summer. Box Hedges: whether you opt for rounded or squared hedges, hedges that weave throughout your garden, or are simply used as borders for garden beds, box hedges bring an old world, country charm to any garden. Sweetly Scented Plants: if you want a garden that is a true delight for your sense of smell, then why not opt for the most sweetly smelling plants you can find. There are plenty of flowers on the market that boast a heavenly perfume, and many edible plants, such as rosemary and some fruit trees smell equally as sweet. Winding Paths: create a sense of drama and movement in any garden. You can finish your paths in all sorts of textures, from pavers, through to stencilled concrete, to add a dash of colour and excitement to your outdoor area. Geometric Garden: if you like all things symmetrical, then a geometric garden is the perfect choice for you. Plot out your garden beds using right angles and sharp corners, which can then be accentuated with all the right foliage. If you’re really dedicated, you can even create a patchwork quilt effect with just a little bit of love and planning. Mixed Greenery: try using a range of different foliage, with all differently shaped and coloured leaves. This is a particularly easy look to achieve with Australian natives—there are all types of native plants available, all in a range of contrasting colours and textures. Edible Plants: if you’ve decided that you’d like your garden to have a dual purpose, then why not create an edible paradise? Plant yourself some fruit trees, all the herbs that you can get hands on, and even some vegetables. Just keep in mind that fruits and vegetables are seasonal, so you’ll need to make sure you’re planting the right plants at the right time of year. Favourite Florals: who amongst us doesn’t like flowers? So, why not fill your yard with your favourite flowers. Consider planting flowers in hues that complement the colour of your home’s paint job. Or, for a much more dramatic finish, why not experiment with a few contrasting colours? Wall Finishes: all too often, the wall finishes in our gardens are forgotten about. Side fences and garage walls are left barren, and looking mighty unappealing. So, why not give them a facelift? Affix a trellis to your side fence and plant a running vine to cover the space in beautiful foliage. Hide unsightly garage walls with interesting cladding, or place hanging baskets in front of them to soften the overall look. Beautiful Accessories: these days, there are so many garden accessories available, from planters and pots, right through to gazebos and water features. Many of these accessories can add a splash of drama to an outdoor space that would otherwise be impossible. So, if you’re giving your garden an upgrade, don’t be afraid to incorporate something a little out of the ordinary. A Resting Place: don’t forget to include an area in your garden where you can sit, relax, and while away the hours. A comfy bench, a cosy daybed or even hammock will all do nicely. Make sure that your resting place includes both sun and shade, and is far enough away from noisy, high-traffic areas. Incorporate BBQ Areas: instead of plonking your BBQ and outdoor setting in the middle of your yard, try to incorporate them into your garden a bit more smoothly. 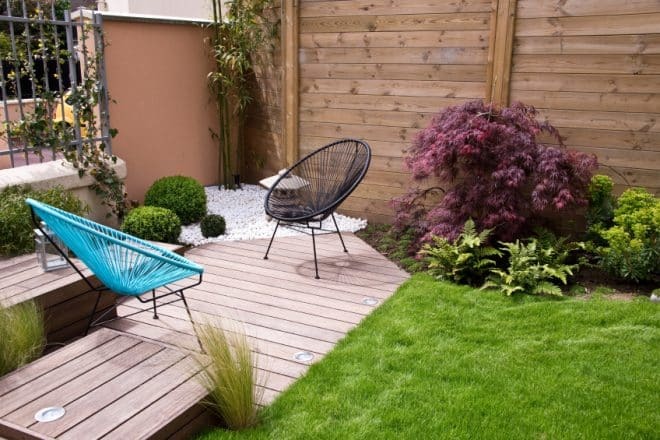 A deck or a paved area is a great way to do this. Then, by surrounding the deck with plants, foliage or box hedges, this blends it nicely with the rest of your yard.